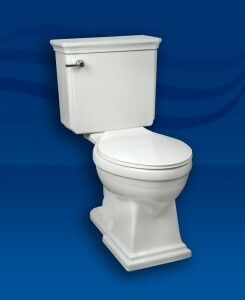 If you’re older than 30, you may remember when toilets used a lot of water … like 3.5 gallons per flush (gpf) or more. Not anymore. Today water-efficient toilets starting at just 1.0 gpf are key to helping save water. Back in 1989, Connecticut was the first state to put water efficiency standards in place. After a handful of other states adopted similar laws, the U.S. Energy Policy Act of 1992 was put in place to set minimum efficiency standards for all toilets, showers, urinals and faucets manufactured in the U.S. beginning in 1994. Severe drought conditions in several areas of the country, coupled with conscious efforts to save water, have led 10 states to adopt strict water efficiency legislation. As you might imagine, California and Nevada lead the way … but Texas, Colorado, Georgia and other states are not are not far behind. The same drought conditions that made states adopt new laws have also been the motivation for Mansfield Plumbing to develop more high efficient toilets (HET). We recently introduced the Brentwood HET with 1.28 Gpf. This latest HET joins a wide range of other products we make in almost every product line that are qualified as HET. We also make HEU products — High Efficiency Urinals — like our Brevity and Cascade urinals for commercial projects. You can expect to see Mansfield Plumbing adding more HET and HEU products in the years to come. As the marketplace demands products that meet WaterSense standards, we’ll keep “upping our game” to produce competitive toilets and urinals that require less water and have stronger mass removal power.